After the culinary buzz he created about Flip Burger Boutique, everyone wondered what Richard Blaise’s next adventure would be. Once you’ve opened a gourmet burger joint, why not sell gourmet hot dogs? 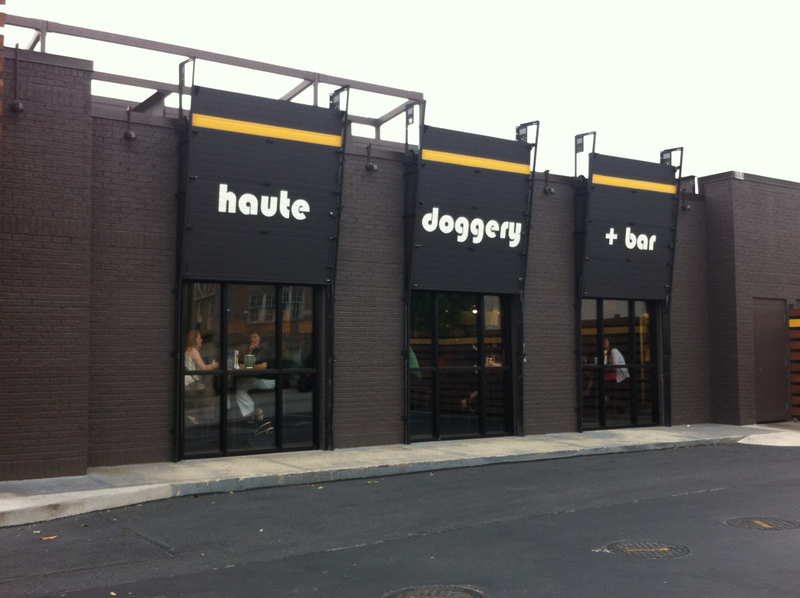 So HD1 Restaurant (Haute Doggery + Bar) opened in September of 2011. One evening as I was coming through town, I turned down North Highland and pulled into HD1’s parking lot. It was early, so there wasn’t much of a crowd yet. 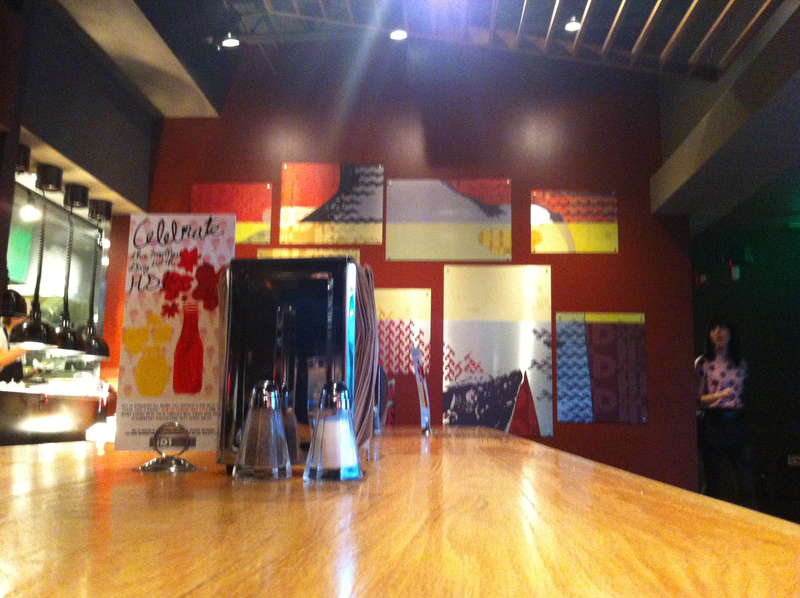 There are high-top tables along the front windows, a bar along the back wall and tall picnic tables down the middle. 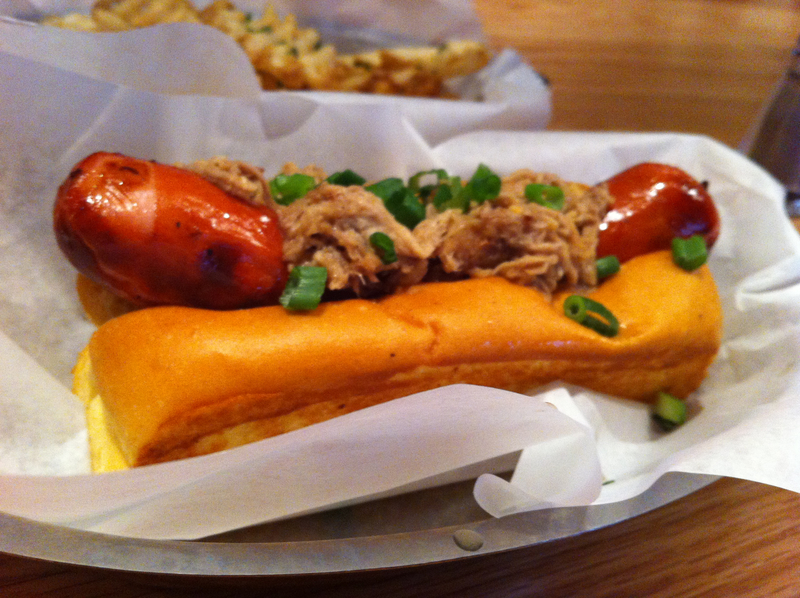 The basic premise is locally sourced high-end hot dogs (and sausages) on artisan buns. I looked over the menu and asked the waiter for recommendations. He suggested either the Eastbound and Down (hot dog served with Carolina pulled pork, country slaw, mop sauce) or the Merguez (lamb sausage with currants, minted cucumber and Labne yogurt). I went with the Eastbound and Down and a side of fries. The dog was served topped with the barbecue and scallions. I had asked that they hold the slaw and when it arrived, I was afraid that they had held the barbecue sauce as well. I asked the waiter about the sauce and he said that it was underneath the dog. It was. And it was very good – a mayonnaise-based barbecue sauce that made me wish this was a barbecue joint instead of a hot dog spot. The fries were very much like Chick-fil-A waffle fries. Not nearly the quality of the hot dog, but okay. It is worth consideration for a return visit.